SRMJEEE Cut Off – SRM University offers B.Tech admission on basis of SRMJEEE. Candidates appearing in SRMJEEE UG look for cut off information to know the least rank required to get admission. 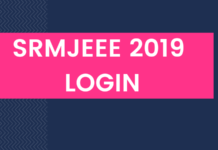 Opening and closing rank of SRMJEEE data will be available when counselling is going on. 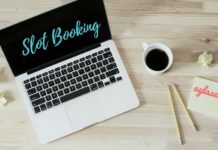 Before the admissions, past year cut off data can be analysed to extrapolate future cut offs and give a goal to the aspirants. 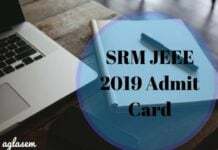 The result of SRMJEE will be announced in the month of May 2019. There is no cutoff for qualifying the examination because the University allocates rank to all the candidates. Candidates can get the idea of counselling schedule and Rank list from the last year, which is given below in table. You can get some idea of cut offs by looking at the Rank list of last year. There are 35 questions each in Physics, Chemistry, Mathematics / Biology. Marks given for correct answers are 3. Now there is no negative marking in SRMJEEE. Therefore, total marks in exam = Number of correct answers x 3. Maximum marks that can be obtained is 315. Tuition fee waiver is given to meritorious candidates. One can check the scholarships available under the heading SCHOLARSHIPS at srmuniv.ac.in. The cutoff of SRMJEEE will be determined on the bases of the below mentioned factors. Difficulty level of SRMJEEE exam. Overall performance of test takers, broadly indicated by the maximum marks scored by topper of SRMJEEE, minimum marks scored by the candidates, and the average marks of all candidates. Number of seats available in the B.Tech program in SRM University. SRM University does not publish cut off data officially. sir i have scored 207 marks in srmjee am i eligible for cse in srm??? pls help me sir.. Please Scroll up for the previous year Cutoffs, and get the estimation. I GOT 156 MARKS , WHAT WILL BE MY EXPECTED RANK?